Welcome to the innovative VoIP call service provided by Globfone. You are no longer required to create an account to place a free calls to both landlines and mobile phones. You need not worry about the rise in bill even as you call phone through Globfone as it is a free service. Now connect to any phone on this planet conveniently and communicate your message without any disturbance through this advanced calling system. Call mobile at any time during the day without worrying about call rates as you can stay connected to one and all through a simple yet effective calling service. Satisfaction of users is given high priority, which is why you will experience and derive joy from the fact that you can call phone local, national or international through your computer. The number of calls and their duration is limited for an IP address. After this limit has been exceeded, a call can only be placed when the next 24 hours begin. Let’s get started, follow these steps mentioned below and place a call through Globfone right now. 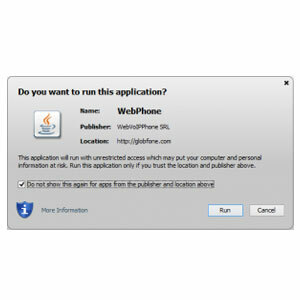 Java VoIP engine – runs in all java enabled browsers, WebRTC – runs in all modern browsers, Flash VoIP: for compatibility with some old browsers. If the right plug-in/technology is not fully supported by your browser, an error message is shown and an option to go to its official website to ensure complete functionality. Your browser may ask for permission to use mic and speakers or the Java application of Globfone WebPhone. A checkbox is provided at the bottom of this dialog box, mark it if you do not want this dialog box to show up the next time you use this service. The next time you place a call through the amazing services of Globfone; this application will start quickly without any delay. Turn on speakers / headset and a microphone. Make sure all audio devices are connected properly and working. Now if everything is in order, you will notice a country list on right side of the screen. Enter the phone number using your keyboard. You can call mobile or call phone landline so enter the number of the phone you want to call. Enter the number using the international phone number format, by placing respective country code followed by the phone number to which a call will be placed. The process of dialing is started by Globfone and a counter also appears on your screen to show time duration for which you can stay on this call. Call length depends on various factors – one of them is destination cost and popularity. Clicking on a red ‘Hang up’ button ensures your call has been disconnected.